Annual Financial statement of JMC for the FY 2016-17. Notification for Election of Chairman of Standing Committees of Jammu Municipal Corporation. Result of Skill Upgradation and Self Employment Committee Elections. Result of General Functions Committee Elections. Result of Housing for All Committee Elections. Result of Swachh Bharat Committee Elections. Notification of the list of candidates duly elected as members of the Standing Committees. SRO - 83 of 2018 dated 09.02.2018 regarding includes the local area within the limits of JMC. 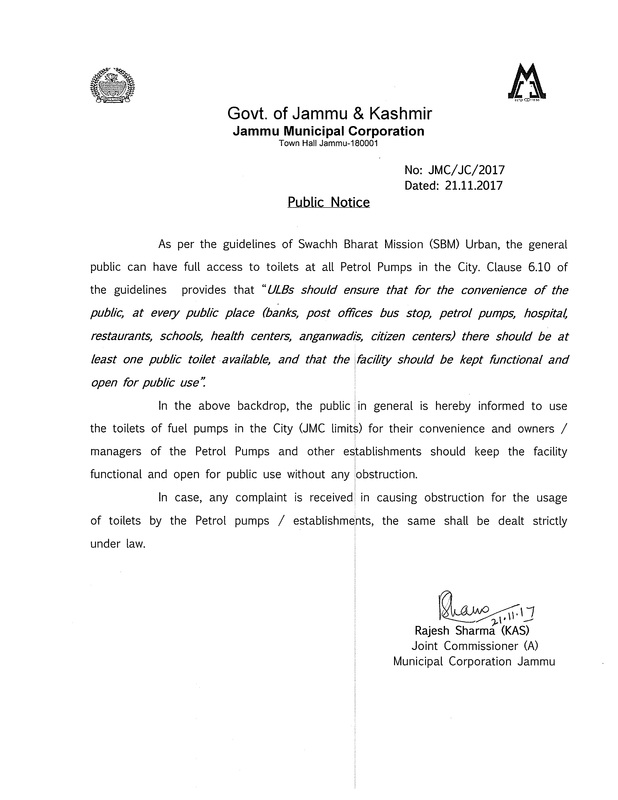 SRO - 268 of 2018 dated 11.06.2018 regarding includes the local area within the limits of Municipal Corporation, Jammu. Notification & Nomination form for Election of Standing Committee's of JMC. Promotion Orders of JMC employees. Engagement of Safaikaramchari's on Need Basis. 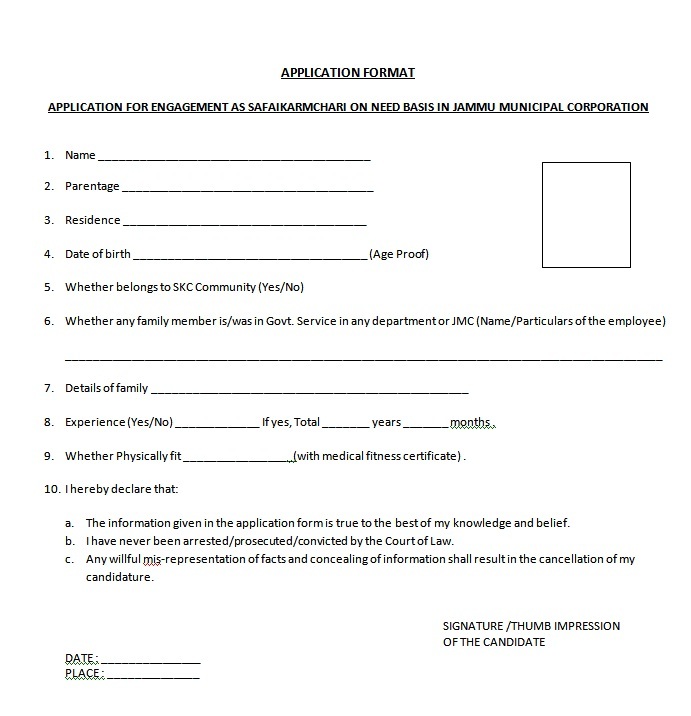 Nomination Paper (Form-I) - Election of Mayor & Dy. Mayor. Annual Financial statement of JMC for the FY 2015-16. Annual Financial statement of JMC for the FY 2014-15. Annual Financial statement of JMC for the FY 2013-14. 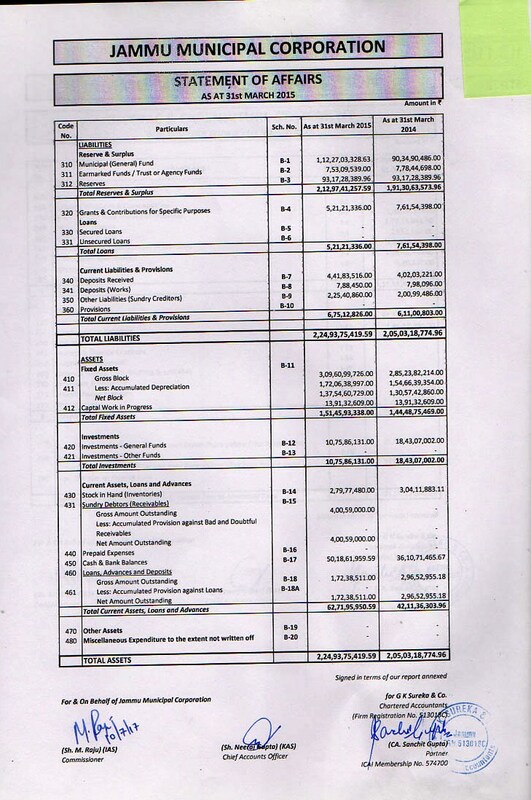 Annual Financial statement of JMC for the FY 2012-13. List of Aadhar Enrollment centres in district Jammu. JMC GENERAL EMPLOYEE SENIORITY LIST. Draft E-Waste policy :- Inviting Suggestions/Comments from General Public. 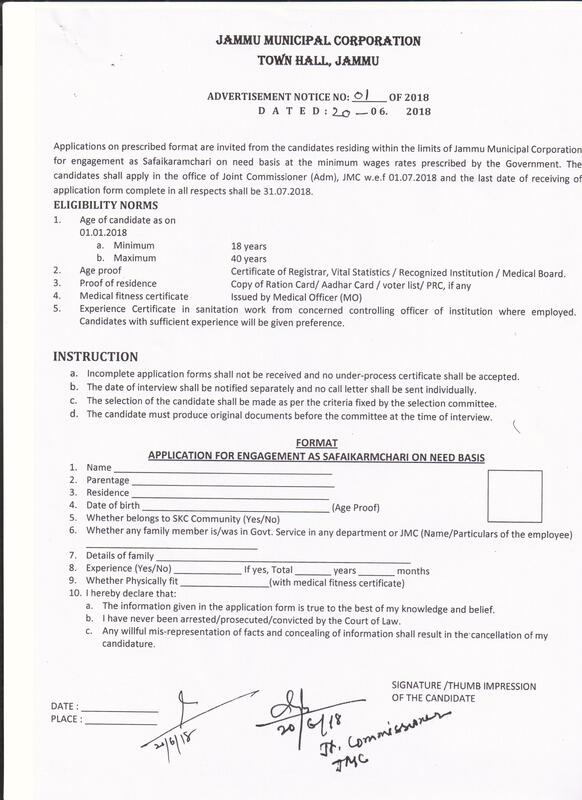 Application Form for Safaikaramchari Post on need basis. Advertisement Notice for the Post of Safaikaramchari on need basis. Notice regarding unathorized absence of Sh. Shashwat Bakshi. In-House Training of PIOs/APIOs of JMC. Constitution of Animal Birth Control (ABC/ARV) Monitoring Committee. Regulation of working of building section-expenditious disposal thereof. Details of PIO of JMC. Establishment of Street Vending Zones/Rehri Zones. WPPIL No. 34/2012, titled Naresh Kumar Gupta V/s State & Others. Seizure of Polythene Carry Bags and allied material. Demand and Collection Book of Revenue. Local fund Audit report for the FY 2014-15 in favour of JMC. Audit Certificate in favour of JMC in respect of maintainance of accounts on Double entry system. Notice under section 10 of clause (3) of the Jammu Municipal Corporation Class-IV Service (Special Provisions) Regularization Act, 2014 regarding regularization of PDL SKC's/Consolidated workers: calling objections & Claims thereof. Revenue Statement of Single Window w.e.f. 2016-2017. Jammu Municipal corporation Budget Estimation. Hearing Dates for First appeal(s) under J&K Right to Information Act, 2009. Revenue Statement of Single Window w.e.f. 2015-2016. Revenue Statement of Single Window w.e.f. 2014-2015. Order regarding nodel officers of e-tendering to make it more transparent. Order Regarding Dairy Unit License and Renewal Fees. Order regarding disallowance of selling the birds in the city. Fixation of modalities for installation of telecommunication towers.